Center right: "Perroneau / 1747"
Elegantly attired and wearing a powdered wig, Charles-François Pinceloup de la Grange slightly raises his head and gazes searchingly into the distance. A member of the Orléans nobility, Pinceloup de la Grange had recently received several prestigious government appointments. The painting and a pendant portrait of the sitter's wife may have been intended to celebrate his achievement. The portrait was painted near the outset of Jean-Baptiste Perronneau's career. 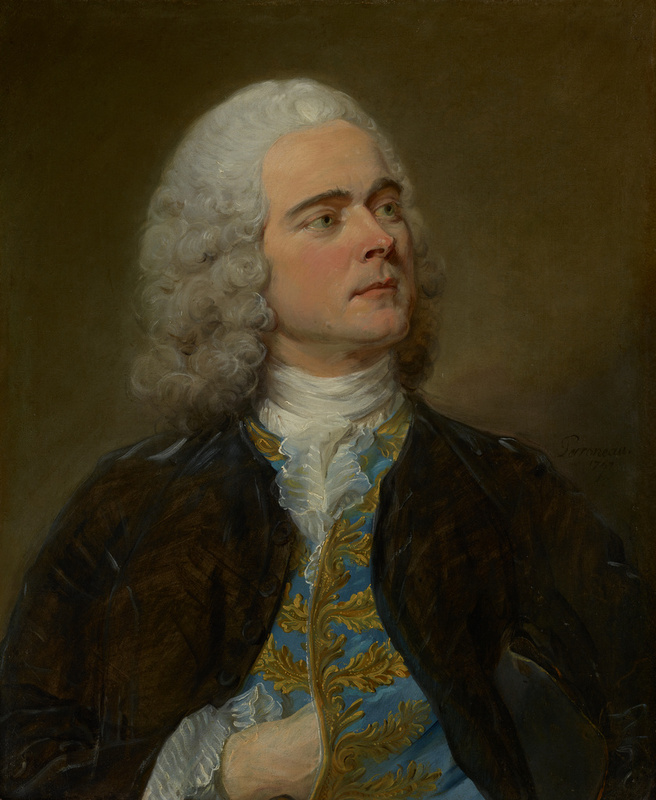 Primarily working in the medium of pastel, Perronneau was one of the most prominent and accomplished portraitists in eighteenth-century France. He was especially successful in securing patrons, like Pinceloup de la Grange, in the French provinces. Stair Sainty Matthiesen (London, England) and The Matthiesen Gallery (London, England), sold to the J. Paul Getty Museum, 1984. Galerie des Ventes d'Orléans, Orléans. Jean-Baptiste Perroneau, 1715-1783: Deux peintures sur toile, la femme au chat, portrait d'un gentilhomme. March 15, 1984, unpaginated, lot 111, ill.
Fredericksen, Burton B. "Recent Acquisitions of Paintings: The J. Paul Getty Museum." Burlington Magazine 127, no. 985 (April 1985), p. 266. "Acquisitions/1984." The J. Paul Getty Museum Journal 13 (1985), p. 211, no. 141, ill.
Foucart-Walter, Elisabeth, and Pierre Rosenberg. Le Chat et la palette: Le chat dans la peinture occidentale du XVe au XXe siècle (Paris: Adam Biro, 1987), p. 139. Rosenberg, Pierre, and Marion C. Stewart. French Paintings, 1500-1825: The Fine Arts Museums of San Francisco (San Francisco: The Fine Arts Museums of San Francisco, 1987), p. 247. Jaffé, David. Summary Catalogue of European Paintings in the J. Paul Getty Museum (Los Angeles: J. Paul Getty Museum, 1997), p. 95, ill.
D'Arnoult, Dominique. Jean-Baptiste Perronneau ca. 1715-1783: Un Portraitiste dans l'Europe des Lumieres (Paris: Arthena, 2014), p. 219, no. 38P, ill.